The chief negotiator of the Palestinian Liberation Organisation (PLO) Executive Committee has said that Hamas and the other factions are not required to recognise the principles of the Middle East Quartet. Nor, insisted Saeb Erekat, does it need to change its political position statements in order to join the national unity government that the PLO is looking to form. The PLO has formed a sub-committee in order to discuss with Hamas the formation of a national unity government, which Palestinian Authority President Mahmoud Abbas has said would recognise the Quartet’s conditions. This includes the recognition of Israel, which Hamas has rejected and considers to be outside the terms of reconciliation agreements. “Neither Hamas nor any other faction is required to recognise Israel or abide by the agreements,” said the veteran negotiator. “We must distinguish between the function of the factions and the function of the government.” He pointed out that the sub-committee consists of all political groups, including Hamas and Islamic Jihad, and that it will start work by early next week. The intention is to form a national unity government made up of the factions, not independent figures, in order to enable it to deal with the problems. However, the government will be committed to a political platform set by the committee, not the individual platforms of the factions. Hence, they will all act within the government’s programme. Erekat called on the factions across the political spectrum to be a part of the “State of Palestine” political programme, and to give “priority to national interests rather than partisan interests.” He added that Israel would refuse to deal with a future unity government just like it refused to deal with one before. Erekat suggested that Israel wants to get rid of Abu Mazen [President Abbas], just as they got rid of Arafat in the past by opening the door to negotiate with Hamas. “This is a waste of time,” he warned, pointing out that the truce in itself is a superior Palestinian interest, but it should not be negotiated by the factions. There is a need to activate the delegation for the truce talks between the resistance and the occupation, which was formed during the most recent Israeli attack on Gaza and was headed by Azzam Al-Ahmad. According to Erekat, they must work on involving the Egyptians in these talks. He denied the existence of any French initiative or project, saying that what was raised is a French move brought up after French Foreign Minister Laurent Fabius met with a number of Arab foreign ministers and the Arab League to draft a UN Security Council resolution to end the occupation. However, no decision has been made yet. Erekat noted that Fabius said he would meet with representatives of European countries and Russia in order to push these endeavours forward. “The PA stressed the need for the components of the French resolution to be based on international resolutions,” explained Erekat, “and refused firmly to recognise the Jewishness of the state [of Israel] or accept any Israeli presence in the territories of the Palestinian state.” He accused Israel of seeking to nip the French proposal in the bud. Saeb Erekat is also the Head of the Supreme National Committee responsible for follow-up with Palestine’s Ascension to the International Criminal Court (ICC). He touched on the issue of joining the ICC by saying that complaints would be filed on 25 June by Foreign Minister Riyad Al-Malki and a team supervising the Palestinian files, of which there are three. The first is regarding Israeli settlements; the second covers Israel’s attack on Gaza last summer; and the third is the prisoners’ file. He added that the follow-up committee is working with a panel of international lawyers and they are reviewing what has been achieved by the Palestinians thus far. The next measure after the filing process, he explained, is that the ICC Chief Prosecutor will submit the findings of the first examination to the ICC’s Judicial Council, and will ask it to examine the documentation to see if an investigation needs to be opened. He said that the Palestinians are seeking a judicial inquiry into the three issues in question. According to Erekat, Russia and China have pledged to the PA that they would block any US attempts in the Security Council to abort the prosecution of the Israelis. A delegation from the prosecutor’s office is expected to arrive in the Palestinian territories on 27 June for an initial fact-finding mission regarding the Israeli aggression against the Palestinians. Palestine officially joined the ICC on 1 April this year, allowing it to prosecute Israeli leaders on charges related to the occupation. “Khader Adnan may suddenly die at any moment, doctors have confirmed to me,” said Jawad Boulos, legal counsel for the Ramallah-based Prisoners Club, on Saturday. Boulos added that he visited Adnan on Saturday morning and found him “in a more critical condition, incapable of moving.” The Palestinian prisoner has been refusing food for 53 days. Israel Prisons Service spokeswoman Sivan Weizman, meanwhile, said Adnan has been transferred to a hospital near Tel Aviv, but refrained from commenting on his medical condition. The 36-year-old Palestinian prisoner and father of six was abducted in July 2014 as part of an Israeli arrest campaign across the occupied West Bank and has since been held under the so-called administrative detention. In 2012, Adnan went on a 66-day hunger strike against his detention without trial or charge. He was freed in April of that year in a deal that also ended the hunger strike of 2,000 other Palestinian prisoners who wanted an end to their administrative detention. The Palestinian Prisoner’s Center for Studies says administrative detention orders in the first three months of 2015 have witnessed a sharp increase in comparison with the same period in 2014. On June 24, the Arab League condemned acts of torture and ill-treatment of Palestinian prisoners at Israeli jails, calling for the release of all inmates who have been held without charge. Two stories, one deathAfter Abdullah’s death, the Israeli army stated that the incident had been an accident.An army spokeswoman told Ma’an at the time that Abdullah had thrown a Molotov cocktail at the military vehicle during “army activities,” causing the driver to swerve, lose control, and hit him on the side of the road.While the Ghuneimat family said they were aware a Molotov cocktail had been thrown, they allege that it was thrown from a roof, not from street level where Abdullah was walking.Bullets seen by witnesses in Abdullah’s body, compounded by Israeli forces preventing the military vehicle from being removed when there was a possibility he had still been alive, have left Kufr Malik residents and Abdullah’s family to believe his death was deliberate.Abdullah had been targeted by Israeli forces before, detained and put in Israeli prison for two years for throwing stones.“There were bullets in his body already,” Adbullah’s mother told Ma’an. “They shot him, and then they killed him. It wasn’t an accident.”“If it was a car accident, why would they let him stay under the car for hours?” The grandfather agreed.The Ghuneimat family told Ma’an that the road running through Kufr Malik doesn’t lead anywhere, and there is no reason for the military vehicles to be passing through the village.But they do pass through, and they pass through often. ‘Show of force’The landscape surrounding Kufr Malik is spotted with Israeli military outposts, from which forces regularly conduct raids in Kufr Malik and surrounding villages.“In the course of an average week, the army comes into the village one, two, three times to arrest people and provoke residents, with no purpose,” Abdullah’s grandfather says.Ex-Israeli soldiers have, however, explained what the purpose is.Raids and resulting clashes like those described by Abdullah’s family are a part of longstanding Israeli military strategy to “demonstrate presence” within Palestinian civilian areas, they say, aimed to cultivate fear among residents.Abdullah’s grandfather explained to Ma’an that every two years a new captain arrives at the military outpost closest to the village makes a point of showing his strength in Kufr Malik, adding that a new captain had recently been stationed there, identifying him as “Captain Raouf.”“I think it [Abdullah’s death] was just show of force. They have been doing this since 1967,” the grandfather said.The Israeli army spokesperson did not have comment regarding the nearby outpost or military activity in Kufr Malik. Tunisia will shut down about 80 mosques accused of inciting violence, Prime Minister Habib Essid has said, after a beach attack that left 39 people dead. The mosques, which operate outside state control, are spreading “venom” and will close within a week, he said. 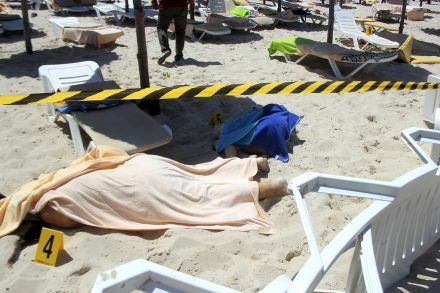 On Friday a gunman opened fire on tourists in the resort town of Sousse. Tunisians, Britons, Germans, Belgians, French and at least one Irish citizen were among those killed in the attack, claimed by Islamic State (IS). The gunman was shot dead by police. Officials say he was a student not previously known toauthorities. This was the second major attack on tourists in Tunisia since March, when militants killed 22 people, mainly foreigners, at a museum in the capital. He said they would be closed by the interior ministry. Referring to Friday’s attack, Mr Essid said most victims were British, without providing details. Earlier, UK Foreign Secretary Philip Hammond said at least five Britons were confirmed dead, adding: “We must expect more reports of fatalities”. Security officials said one attacker, who had posed as a swimmer but was carrying a rifle under a parasol, started shooting on the beach before entering the Hotel Riu Imperial Marhaba, continuing to shoot. One British holidaymaker in Sousse, Steve Johnson, told the BBC: “We were just lying on the beach as usual and… we heard what we thought at first was fireworks. IS said it was behind Friday’s attack, identifying the gunman as Abu Yahya al-Qayrawani. Social media accounts close to the group showed pictures of him. IS had urged followers to step up assaults during the holy Muslim month of Ramadan. This was a brazen attack that has affected everyone here. Tourists gathered in the hotel lobby of the Marhaba Imperial consoling each other. Most were thankful they had survived and described a day where they faced their worst fears: not seeing their children again back home or losing a loved one before their eyes. A woman sat in alone in a corner silently crying with her packed luggage sitting beside her. So many here were frustrated at having to stay at the scene of the attack tonight, but one busload after another took many of the residents away. These are sobering times for a country, and people now reeling from the effects of deadly attacks on tourists. But the people of Sousse remain defiant: they are socialising with friends and family, and large parts of the city are still lit up on what is arguably its darkest day yet. One survivor told the BBC how her fiance, a Welsh tourist, had been shot three times as he used his body as a shield. “He took a bullet for me,” said Saera Wilson. “I owe him my life because he threw himself in front of me when the shooting started. “It was the bravest thing I’ve ever known. But I just had to leave him under the sunbed because the shooting just kept on coming. “I ran back, past bodies on the beach to reach our hotel. It was chaos – there was a body in the hotel pool and it was just full of blood. “Any British nationals in these hotels or nearby should remain indoors, and contact their tour operator and the Foreign Office,” the FCO said in its updated travel advice. Many of the tourists in hotels affected by the attack left the country overnight with tour operators arranging special flights to take them home. Friday’s attack was the deadliest in Tunisia’s recent history. The country has seen militant Islamists gain strength since the overthrow of long-serving ruler Zine al-Abidine Ben Ali in in 2011. Democratic elections after Ben Ali’s removal saw the moderate Islamist Ennahda party take power before the secularist Nidaa Tounes government won a parliamentary poll in October. However, neither party has been able effectively to combat Islamist violence – which has been made worse by conflict in neighbouring Libya and by Tunisian fighters returning home after joining Islamist campaigns in Iraq and Syria. BETHLEHEM (Ma’an) — A committee appointed by the Palestine Liberation Organization began talks with both Hamas and Islamic Jihad on Saturday on forming a new national unity government, a committee member told Ma’an.Hanna Amireh, who is also a member of the PLO Executive Committee, said that discussions were including Hamas and Islamic Jihad with the aim of including the movements in the new government. However, Amireh added that if negotiations and consultations with Hamas fail, a decision to form the government without the movement could be made. He said that President Mahmoud Abbas will decide on who will head the new government, although he added that no individuals have been selected yet. The committee is being headed by senior Fatah official Azzam al-Ahmad and has been given a time period of one week for discussions. Amireh said that more time will probably be necessary. He added that independentPalestinian factions will also be consulted. The dissolution of the current unity government was announced earlier this month at an annual Fatah council meeting, although the government has yet to hand in its resignation. Hamas condemned the move, claiming it was a unilateral decision by Fatah in violation of the 2012 Cairo agreements between Fatah, Hamas, and the Palestinian National Council. However, the unity government that was formed last June out of the agreements has repeatedly failed to overcome divisive issues between the two rival parties. While there has been talk of a government reshuffle for months, it is expected that the new government will have a completely different structure, with factional leaders replacing independent technocrats.Amireh claimed on Saturday that Hamas had declared conditional approval of a government formed but not entirely comprised by the PLO, of which neither Hamas nor Islamic Jihad are members. “In light of what has been circulated about the PLO’s Executive Committee tasking Azzam al-Ahmad with conducting consultations over the formation of a new government, Hamas calls upon all factions signatories of the Cairo agreement to start comprehensive dialogue,” the group said in a statement Friday. RAMALLAH (Ma’an) — No deal has been reached between the Israeli authorities and Palestinian prisoner Khader Adnan who on Saturday entered his 54th day on hunger strike, his lawyer said.”(Israel) is seeking to end Adnan’s hunger strike in a way that avoids them a feeling of crushing defeat,” the Palestinian Prisoners’ Society’s chief lawyer Jawad Bolous said at a press conference in Ramallah on Saturday.”On the other hand,” he added, “what Adnan seeks is very clear: either to be released or tried. Khader is a gift for humanity since he is willing to sacrifice his life, and all he asks Israel for is to treat him as a human.”Adnan, 37, began his hunger strike nearly two months ago to protest the Israeli practice of administrative detention, under which Palestinians can be held without charge or trials for months or years.He has said he will continue his strike until Israel agrees either to release him or bring charges against him.It is the second time Adnan has gone on hunger strike against the practice, following a 66-day long hunger strike he undertook in 2012 — the longest carried out by a Palestinian in Israeli detention.Bolous said: “Once Israel apprehends that Khader has become a popular icon in Palestine and the world, we will immediately reach a solution.””Adnan loves life and he doesn’t seek to die a martyr, but if he dies a martyr, he will welcome that. On the other hand, Israel doesn’t want Adnan to die in custody.”In recent days, Adnan’s health has deteriorated sharply, with the International Committee of the Red Cross saying on Monday that his life was “at immediate risk.”Bolous said that the Israeli hospital in which Adnan is being held notified him late Friday that Adnan’s health had further deteriorated. “The hospital was on alert and they prepared for resuscitation,” he said.Adnan’s wife Randa, who lives in the West Bank district of Jenin, urged Palestinians to take steps that will see Adnan released, “rather than releasing statements vowing to intervene if he dies.”The Islamic Jihad movement — with which Adnan is affiliated — said Friday that if Adnan dies in Israeli detention, the ceasefire agreement that ended last summer’s devastating war in Gaza would be at stake.Randa also appealed to media outlets to avoid publishing unconfirmed news about her husband “such as the recent rumors claiming he has died.”Adnan was detained in July last year and sentenced to administrative detention for the 10th time in his life.In addition to protesting administrative detention in general, he also wrote in an open letter last month that he hoped his strike would prevent Israel from tarnishing the achievement of prisoners who secured their freedom by going on hunger strikes in the past, only to be rearrested by military forces.In 2012, he agreed to end his hunger strike along with 2,000 Palestinian prisoners who had joined his strike after Israel agreed to lessen the practice of administrative detention and improve prison conditions.Despite Israel’s agreement, around 500 Palestinians are currently being held under administrative detention among a total of nearly 6,000 Palestinians in Israeli prisons. The fact-finding committee set up by the Syrian Coalition to look into reports of violations in the Tal Abyad area concluded that the Kurdish People’s Protection Units (YPG) militias, the armed wing of the YPD committed widespread violations against the civilian population in the area. The report prepared by the fact-finding committee lists violations ranging from sending threat messages via telephone to publishing “wanted lists” on social network sites by persons affiliated with the YPG such as Khabat Ali, son of the head of the so-called Kurdish Provincial Council in Tal Abyad. Ali published lists of names of local residents described as “wanted” by the Kurdish Asayish militia on his Facebook page. The reports confirms that the YPG militias seized vehicles, livestock, crops, and ransacked houses upon taking control of the Arab and Turkmen villages. They also scrawled anti-Arab racist slogans on the walls of Tal Abayd and the surrounding villages. Before entering the Tal Abyad area, they sent threat messages to the local population, prompting them to flee their homes. Residents of the area also feared the repetition of the grave violations committed by the YPG militias against Arabs few months ago in rural Al-Hasaka. The latest forced displacement took place in the villages of Hammam al-Turkmen whose residents were forced out of their homes. The local population confirmed that this is part of the YPG plan to empty the area of ​​its indigenous population and establish a Kurdish state in this area. The fact-finding committee asked the YPG militias to give it access to the Tal Abyad area and assess the situation through listening to witness accounts and to assess the size of the reported violations. However, the YPG militias repeatedly rejected the demands of the committee which waited at the border crossing for several days. This reinforced fears of the displaced persons who did not dare to return to their homes despite the opening of the border gate. On June 22, 2015 around 2,000 displaced people who fled to Turkey returned to their homes, but the number began to decrease considerably with the spread of the news about the YPG’s blocking entry of the fact-find committee. The Syrian Coalition calls for the United Nations to immediately send an international investigation mission to enter Tal Abyad and the surrounding villages to look into the violations committed by the YPG and also demands that those responsible for these violations are held to account. Moreover, the Syrian Coalition also calls for allowing human rights organizations and journalists to enter Tal Abyad to convey the image to the world and the size of the tragedy and the damage the YPG caused to the unarmed civilians. The Syrian Coalition also calls for allowing the entry of humanitarian convoys and medical assistance to alleviate the increasing suffering in an area that lacks the necessities of life. The Syrian Coalition calls upon the international anti-ISIS coalition to neutralize civilians in the conflict zones and not to fall for false allegations about the presence of terrorists in the areas already void of ISIS militants. The YPG militias have repeatedly threatened the local population that in case they do not leave their villages they will give the coordinates of their villages to the international anti-ISIS coalition to bomb them on the pretext that ISIS militants are holed up inside these villages. ALKHALIL, (PIC)– Israeli Occupation Forces (IOF) quelled a peaceful march, at noon on Saturday, demanding protection of Bait al-Baraka against confiscation by Israel. Besides, a Palestinian man was arrested by IOF soldiers within a storming campaign in al-Khalil on Saturday. Eyewitnesses revealed that the IOF soldiers suppressed a march organized by the Popular Committees against the Wall and Settlements and assaulted by beating the participants leaving many of them with bruises were treated in the field. According to the organizers, the march aimed at condemning the decision made by the Israeli army Minister Moshe Ya’alon on renovation of Bait al-Baraka which is located on lands in Bait Ummar town between Bethlehem and al-Khalil for the purpose of establishing a Jewish outpost in the location later on. In a similar context, the IOF soldiers rounded up a Palestinian young man from al-Khalil in the southern West Bank and carried out a storming campaign in the city. Local sources revealed that the Israeli forces raided the Old City of al-Khalil, broke into the houses of Palestinians and arrested Hamdi Abu Hamdiya. He was taken to an unknown destination, the sources pointed out. Israeli military vehicles raided the nearby Doura town, stopped Palestinian cars and verified the IDs of its passengers, eyewitness disclosed. Eyewitnesses told the PIC reporter that Israeli policemen erected a military checkpoint near Gosh Etzion outpost in northern al-Khalil city and stopped a Palestinian car carrying four young men who were detained for hours and their IDs were verified before letting them pass at a late hour on Friday. srael has deported nine Turkish citizens, including journalists and activists, after holding them for over six hours at Israel’s Ben Gurion International Airport on Thursday. Ulke TV Editor-in-Chief Hasan Ozturk, Ozden Ayvaz and Huseyin Gunay from TRT News, Halime Kokce from Star newspaper, Memur-sen vice chairman Levent Uslu and four activists – Kemal Ozdal, Durdane Ozdal, Fatih Bolcan and Sumeyra Bolcan – were detained at the airport. “We are under detention for six hours at the Ben Gurion Airport with a group of journalists and activists. They questioned us individually,” Kokce wrote on Twitter. She said in another tweet that Israeli officials confiscated the group’s cell-phones and quizzed them on their WhatsApp conversations and contacts. In a final tweet, Kokce said the group had been informed they were being deported, and had been banned from entering Israel for ten years.